Mike Mearls sent off some tweets, and the rest is history... or argument. Yeah, probably just a bunch of geeks arguing about D&D. Good times! 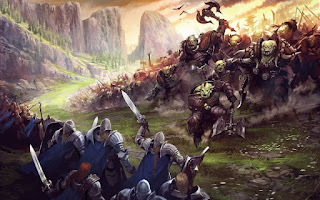 This ENworld thread has just exploded with cutting barbs, jabs, thrusts, edition warring cloaked in design preferences, ignorance, nerd rage, ruining the hobby, and the OSR. All the hits! Basically, 5e is the modern equivalent of old school D&D. Well, as much as they could get away with and still appease the masses (O5R). Regardless of modern concessions, a few people still don't like it. And of course, many grognards believe 5e didn't go far enough (into the past). Reading that behemoth of a thread should give WotC all the understanding it needs to go forward and continue the legacy of Dungeons & Dragons. It almost seems as if we're headed for a paradigm shift - gamers realizing that endless character optimization choices and rules for everything under the sun isn't real roleplaying, and those preferring endless crunch, micro-balance, and systems protecting players from GM decisions (right or wrong) is objectively less fun... and also not D&D. So, how do you feel about this great 5e debate and what does it mean for D&D specifically and RPGs in general? p.s. If readers want me to pull up specific posts/arguments and talk about them, say so in the comments!